Templates are predefined set to structures that can be used when necessary without having to enter detailed settings manually. You can define multiple templates of folder and file structures and properties like security, allowed profiles and Audit Trail settings. •Set of Folder Structure with predefined profile, security, audit events and customize column to display. •Set of File Structure with predefined set of files that users can choose from while creating new documents. •Profile template to associate with the documents of its type. •Users security and access rights template to make available with the documents of its type. •Audit event template to monitor on the documents of its type. If you create a lot of similar folder structure, then you can save time by adding a folder structure as a Template. You can also associate profile, security and audit log events to a template. You can then create new folder based on the predefined Template. Examples of useful templates can be Order template, Insurance template, Legal template, Project Template. By using the Template, you can customize the contents for a folder so that, when a user creates a new folder of that type, the folder is pre populated with multiple files and documents based on template selected. If your organization uses a particular Project template, you can create: folder structure to use to store the documents for that project, a profile that defines the meta data for that project, set the security rights for the selected users or groups for that project and auditing of actions related to the project. Then, any folder to which you associate the Project Template will include all of these features and will enable the user to create new project folder based on the template. In Docsvault, when you create a folder , a 'From Folder Template' option is available against Type in New Folder dialog box. 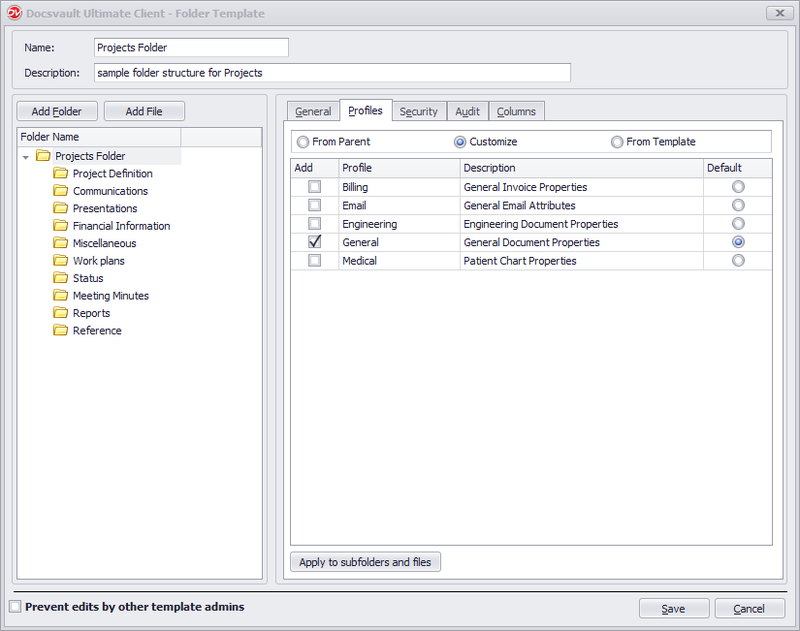 The 'From Folder Template' displays a list of templates form where you can select to create a folder structure. Each document will inherit its settings directly from the core Folder Template. This will also ensure that the basic columns for your folders, such as Title and Created By that are associate with a template, are present.